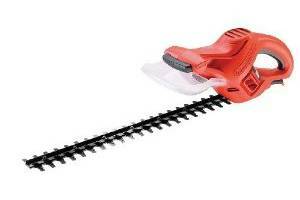 The Black and Decker Gt100 and Black and Decker GT115 hedge trimmers are very similar in price and performance. They are both lightweight machines with more than respectable capabilities. Very lightweight in fact, so perhaps not quite as robust and durable as some of the competition, but then they are so very affordable. They are not meant for heavy duty work and those with large and rampant hedges should perhaps choose more powerful machines. But for smaller hedges and even some topiary work they are more than adequate and their light weight makes them a pleasure to use. 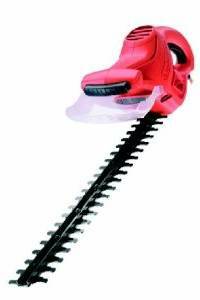 They can handle branches up to 1/2″ to 5/8″ thick and both models simply glide through leafy twigs. Black & Decker has emphasized safety in the design and both machines require two-handed operation. This does affect reach, especially when standing on a ladder, but at least there is little risk of injuring your hands. There is also a safety shield for protection against flying debris. Be warned, though: it is very easy to sever the cord – as several reviewers discovered! The intention with both the Black & Decker Gt100 and Black & Decker GT115 hedge trimmers seems to have been to produce an inexpensive piece of equipment which is at the same time adequate for most home gardener’s purposes. The GT100 was reasonably popular, but there were criticisms of the blade length. The GT115 was then produced to address this issue. The differences in weight and power are minimal, and where the GT100 was perhaps a bit too powerful for the blade length, the GT115 seems to be spot on. Generally, it can be said that the quality for the price is very good. They are so close that choosing between the two can be a problem, but unless the £8 to £10 price difference is significant to you, then the GT115 would probably be the better buy as that extra blade length makes it just that bit more useful in the gardener, The slightly increased weight and marginally-reduced general handiness is really not significant. One feels that the average gardener might come to regret having purchased the GT100 when the GT115 was available. Most reviewers were very happy with the general lightness and handiness, although the two-handed operation was sometimes a mixed blessing – but preferring safety over improved handling is probably the right option. There were comments about how easy it was to cut the cord, so particular care needs to be taken with this. As with most electrical equipment, even much more expensive models, there were also some issues with excessive noisiness and other faults, but any such manufacturing faults are covered by the guarantee. Generally, they are excellent machines. using these links to visit the product pages. As long as your requirements do not exceed the limitations of the design, you are sure to be pleased with either of these hedge trimmers. This entry was posted in Electric Trimmer Reviews and tagged Black and Decker GT100, Black and Decker GT115. Bookmark the permalink.